Glenlyon is a rural village between Daylesford and Malmsbury, 85 km north-west of Melbourne. An early pastoralist in the area, Archibald Macarthur Campbell, probably gave the name Glenlyon, as the Scottish family seat of the Campbells was Glen Lyon. It is situated on the Loddon River, and was a gold mining town until the 1870s. The Glenlyon Road District was proclaimed in 1860 and a school was opened in 1861. Three hotels were recorded in the mid-1860s, along with a flourmill. The Loddon River bridge was built in 1864. After the decline of alluvial mining agriculture and sawmilling were the main industries. Glenlyon Shire was proclaimed on 12 December 1865. 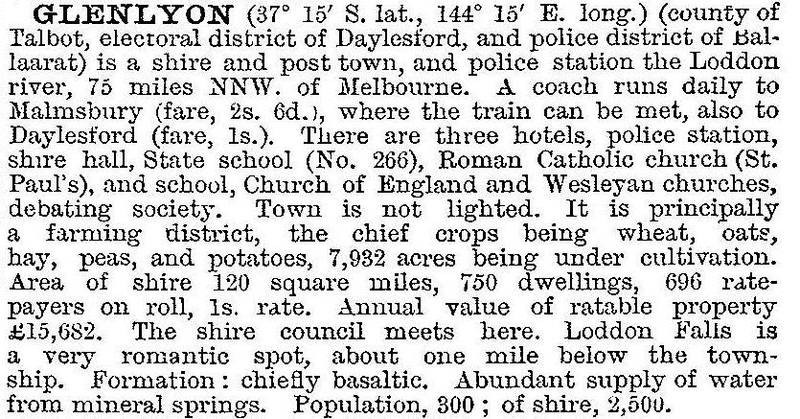 Its area of 310 sq km included the timber towns of Bullarto and Lyonville (which gained a railway line to Daylesford in 1880), Drummond, Coomoora and Yandoit. (Coomoora was also a gold town, with a large flourmill.) 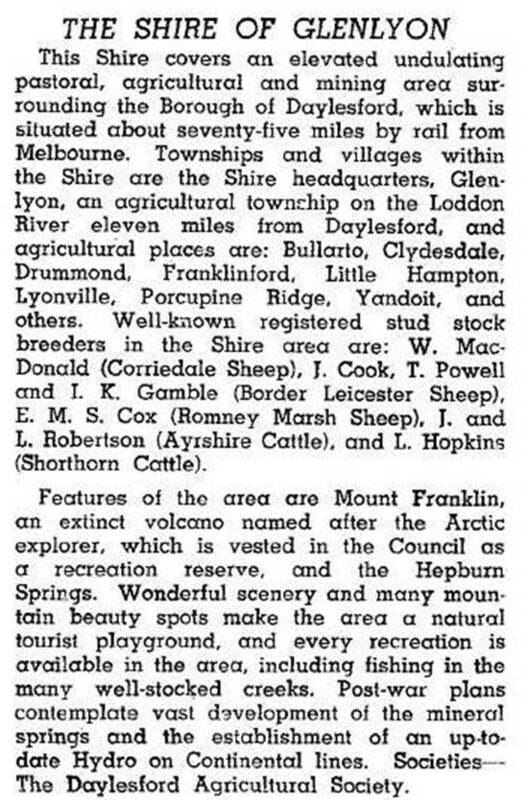 Glenlyon Shire absorbed Mount Franklin Shire in 1915 and was united with Daylesford borough to form Daylesford and Glenlyon Shire in 1966. The optimistic post World War II spa development probably related to Daylesford and Hepburn Springs, and their resurgence had to await three doldrum decades until the 1980s. Glenlyon has a recreation reserve, a public hall, a sawmill, a general store and Catholic and Anglican churches (1869, 1874). An annual food and wine fair is held at the hall. The springs and the Loddon River falls are set in attractive bushland. The school closed in 1993.